We shouldn’t complain, but this Summer in the UK it’s been hot and sometimes, whisper it, humid. Yes it’s incredibly rare and us Brits didn’t know what to do with ourselves, or rather, our hair! My hair tends to go ‘poofy’ when exposed to humidity – but I think I’ve found the solution, the Aveda Smooth Infusion Range. Aveda skincare has always been a favourite of mine, a friend introduced me to the Botanical Kinetics toner which i’ve been using ever since, and when my hair needs some serious loving I always reach for the Aveda Dry Remedy shampoo & conditioner (review here). But the Smooth Infusion range promises to tame frizz and protect hair, moisturise, and smooth the hair surface. I find the shampoo lathers really well, and unlike the Dry Remedy which I have to rinse really thoroughly, the Smooth Infusion shampoo rinses away really easily which leaves my hair feeling clean and fresh. I also adore the fragrance – it’s quite flowery but still sumptuous and fresh. The conditioner is the key product for me, from the whole collection. I really notice a difference when straightening my hair – my hair doesn’t dry out so much as hair is protected, and it looks glossy and smooth. When applying in the shower it spreads easily through my hair and it feels incredibly rich and buttery – like a deep conditioning treatment. Next, I apply the Glossing Straightener – another product which protects from heat and works to reduce frizz and smooth down and fly-aways. A small amount applied to the ends of my hair goes a long way – I have to use much less of this than when I’ve used other products in the past. I have long thick hair and I apply a blob the size of a walnut. Overall, when I use the range I notice that my hair looks and feels healthier, there is more of a shine and I definitely notice that my ‘poofyyness’ is tamed – this set will definitely be coming with me next time I travel somewhere warm! 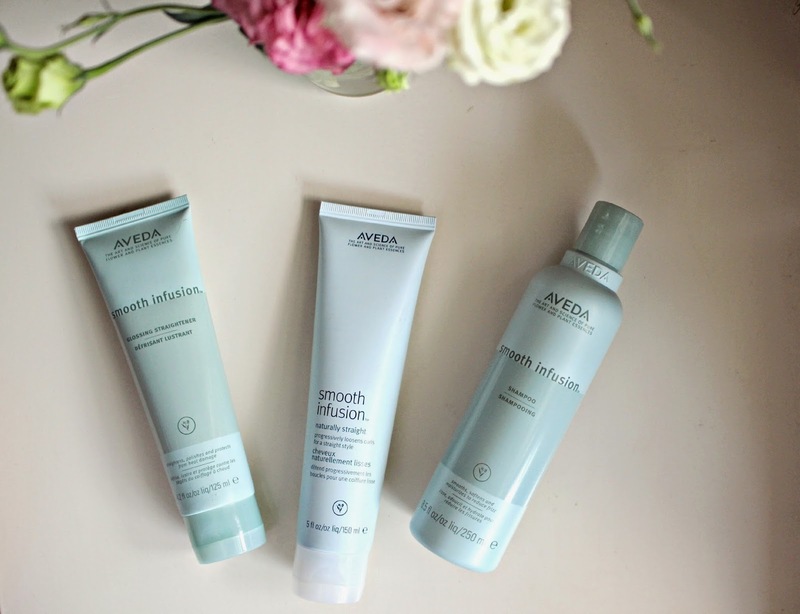 The Aveda Smooth Infusion range is available from £17.50 online and in hair salons.